Use these 10mm Single Color LED Strip light snap connectors with your own custom wire lengths to create 10mm wide strip light connectors for any of our non-waterproof Ribbon Star 10mm wide 2 wire LED Strip Lights listed below. These connectors are designed to easily connect 18-22AWG stranded wire to your single color strip lights. To connect simply pull back the tab, insert your strip, insert your wire, and snap the tab back into place. This product is not waterproof and intended only for use with our indoor LED strip lights. 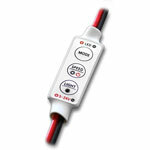 A small relief for the LED chip allows this connector to be used with a more dense strip light. 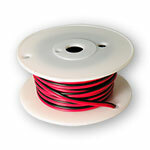 Please note: This product works best with soldered wire leads using 18-22AWG stranded wire. Our Ribbon Star MegaLux Warm White LED Strip Light is by far the brightest 24VDC LED Strip Light on the market boasting an astonishing 1,830 lumens per foot. 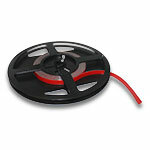 This ETL Listed 118" (3m) LED ribbon can be cut every 1.97" and must be soldered to re-connect and must be mounted to a metal heat sink. 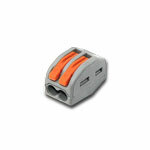 Comes with a heavy duty double sided mounting tape on the back, for the best long-term mounting solution. 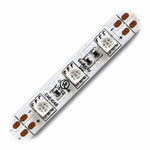 6 high output 2835 SMD LEDs per 1.97" for a total of 360 high output LEDs per 118" LED strip. At 15.4 watts per foot this strip requires at least 150W of 24VDC Constant Voltage power (6.25A) per 118" strip. This LED Ribbon strip is so bright it can directly replace T-8 and T-12 Fluorescent bulbs in home and business interior lighting, light boxes, and signs. 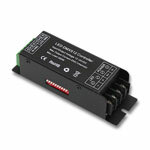 It can also be used for overhead lighting, cove, under cabinet, back lighting and many more applications. We recommended that you mount this strip to steel or aluminum, for a good heat sink. 2700-2900K Color Temperature, ETL Recognized, RoHS and CE approved.